Jessica Moreno-Caycho graduates on Saturday from Virginia Commonwealth University. Late spring is graduation season for schools across the United States. It's a time of joy and hope for many, but for DACA recipients and their families it can bring added anxiety. For many of these "DREAMers," the threat of deportation looms over their graduation celebrations. 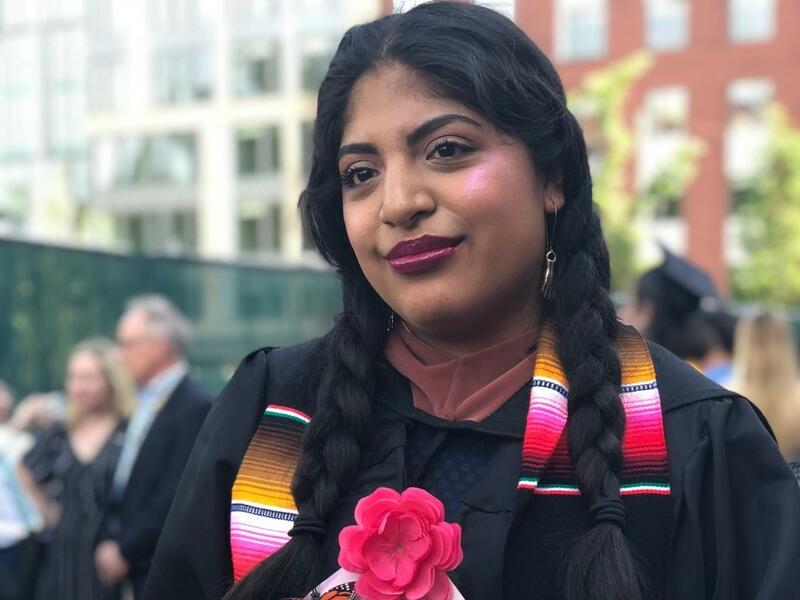 NPR's Scott Simon spoke with Jessica Moreno-Caycho, a DREAMer graduating this May from Virginia Commonwealth University. Moreno-Caycho said she came with her family to the United States from Peru in 2003. She was 8 years old when she arrived. "I remember my family, our home, the school that I used to go to, a couple of the parks. But they are very distant memories," Moreno-Caycho told NPR. She said that for all practical purposes she considers herself an American. Under DACA, the Deferred Action for Childhood Arrivals program, children brought to the United States illegally by their parents are temporarily shielded from deportation. The program, which was created by the Obama administration in 2012, allows Moreno-Caycho to work, drive, and obtain a social security number. "Having that little bit of privilege," Moreno-Caycho said, allowed her to pay for her college tuition. "Especially because as undocumented people here in Virginia we are not eligible for any state financial aid and much less any federal financial aid to begin with." President Trump announced that he would end DACA in September of last year. Since then, Congress has struggled to provide certainty to the hundreds of thousands of individuals covered by the program. "It was something that we had been expecting for a while," Moreno-Caycho said, "but you know it didn't feel real until it was actually real." She hopes that Congress can agree on a clean DREAM act and says she will continue to fight for comprehensive immigration reform. Moreno-Caycho graduated on Saturday from Virginia Commonwealth University School of the Arts, one of the nation's premiere fine arts programs. She has been studying costume design and said that after graduating she will pursue her master's at the University of Washington School of Drama. "Theater has definitely been an escape," she told NPR. "It's all these stories about people that you don't usually hear about. Whether they're queer, brown, black, trans, undocumented," she said, "I think that it's really magical and it really paints a really great picture of everybody on stage." NPR's Ian Wren produced this story for digital. It's graduation season for colleges and universities across the United States - a time for celebration for many families but also added anxiety for DACA recipients. The DREAMers have been able to finish and get college degrees but must worry that they might also be soon deported. Jessica Moreno-Caycho is a DREAMer who came to the United States with her family in 2003 from Peru. She's graduating from Virginia Commonwealth University School of the Arts costume design program. She joins us from Richmond, Va. Thanks so much for being with us. JESSICA MORENO-CAYCHO: Thank you so much for having me. SIMON: So may I ask how old you are when you came to the United States? MORENO-CAYCHO: I was 8 years old. SIMON: Remember anything of Peru? MORENO-CAYCHO: Yeah, I remember my family, our home, the school that I used to go to, a couple of the parks. But they are very distant memories. SIMON: Yeah. You're American for all practical purposes? SIMON: Have you had extra anxiety this year, your senior year of college? MORENO-CAYCHO: Oh, yes, a lot. I graduated high school having DACA and, you know, having that little bit of privilege of having a work permit, a Social Security number and being able to drive through that. So I've gotten used to, you know, like being able to provide for myself, for my family, to pay for my own tuition - specially because undocumented people here in Virginia, we are not eligible for any state financial aid and much less any federal financial aid to begin with. So when DACA was rescinded, it was something that we had been expecting for a while since this presidency came to its terms. But, you know, it didn't feel real until it was actually real. SIMON: May I ask where your parents are? MORENO-CAYCHO: My parents are living in Northern Virginia right now. SIMON: They've had a hard time too - or anxious time, I should say. MORENO-CAYCHO: Not as anxious as I have been mainly because they're very confident that if something happens, then something better is going to happen. SIMON: What would something better be? MORENO-CAYCHO: Hopefully a clean DREAM act - something that's not going to increase border security, is not going to increase law enforcement in our communities - only, you know, for the protection of the youth when, you know, we - the only reason why we are wherever we are is because of our families and our communities. And most of those communities, you know, they wouldn't be eligible for a DREAM Act. So if we're eligible for it, why should our eligibility hurt them - hurt our communities? And after that, you know, we're going to keep fighting for comprehensive immigration reform - that way our families also don't have to continue to suffer and to live in the shadows. SIMON: I'm told theater has been particularly important to you over the past couple of years. MORENO-CAYCHO: Yes, it has. Theater has definitely been an escape to just, you know, work on the show, work on the production and see the magic of it going up and seeing that art. And theater has just become so much more diverse. All these stories that just tell these stories about people that you don't usually hear about. Whether they're queer, brown, black, trans, undocumented, it's all these stories. And I think that it's really magical, and it really paints like a really great picture of everybody on stage. SIMON: What shows have you worked on? MORENO-CAYCHO: Here at VCU, we just closed "Into The Woods." SIMON: Well, lots of luck to you - very good speaking with you. SIMON: Jessica Moreno-Caycho, VCU's class of 2018, soon to be a master's candidate at the University of Washington. Congratulations. Thanks very much. (SOUNDBITE OF STEPHEN SONDHEIM SONG, "INTO THE WOODS") Transcript provided by NPR, Copyright NPR. Communications major Marivelisse Acosta attends Central Connecticut State University. 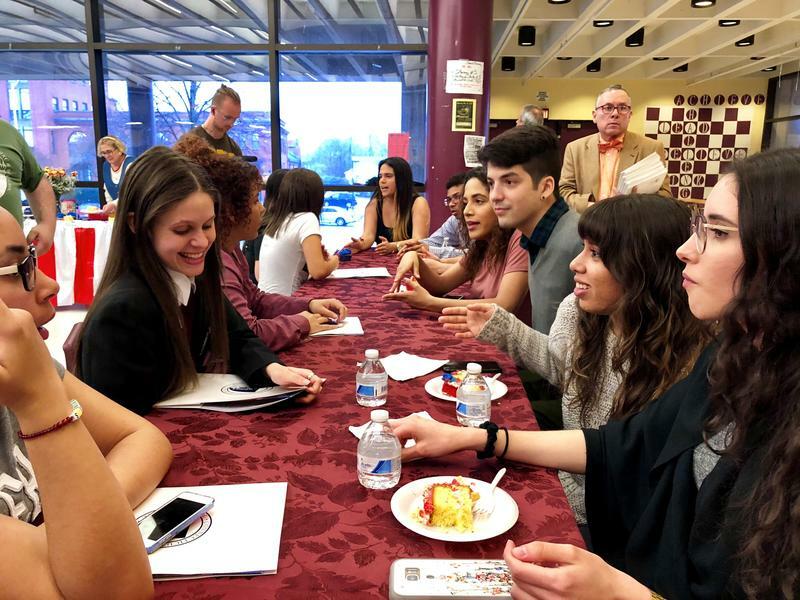 But on Wednesday night, she stood in the cafeteria of Hartford’s Bulkeley High School, contemplating what to say as a mentor to the school’s displaced students from Puerto Rico.